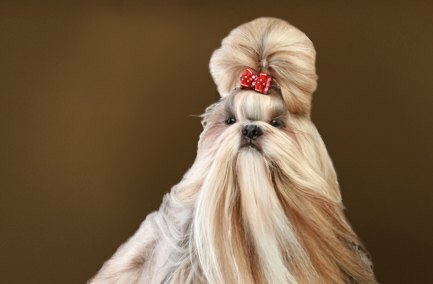 The Shih Tzu is an abundantly coated dog. It is a solid, sound little dog that is rather heavy for its size. Shih Tzu are distinctly arrogant with a character all their own. They are exceptionally good natured, affectionate and intelligent. They are full of life and have an air of importance that cannot be denied. A luxurious, long, flowing coat with an undercoat that may be slightly wavy but never curly. All colours are acceptable providing they have black noses, lips and eye rims. The exceptions are the livers and blues which have pigmentation that compliments that particular colour. This is a smaller type of dog, height at withers approximately 9 to 10-1/2 inches (23 – 27 cm).